Dr. Ray Silvio Greco of Weirton WV, passed away peacefully on October 16, 2017 surrounded by his children and grandchildren. 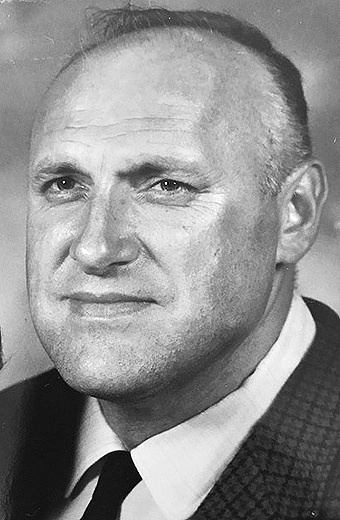 Dr. Greco was renowned for his devotion and passion for his beloved wife, his family, his love of medicine, and the Weirton community. Dr. Greco was born Silvio Guilio Greco on December 26, 1924, in Fairmont, West Virginia, to Francesco and Angela Maria Greco. He was raised in a four-room apartment above a grocery store in the Italian enclave of East Fairmont and adopted the name “Ray” early in his life. As a young man he was known for his pool shooting skills and his smooth dancing. A 1941 graduate of East Fairmont High School, Dr. Greco accelerated through the war-time education programs of West Virginia University and the two- year West Virginia School of Medicine before graduating from the Medical College of Virginia in 1947 at the age of 22. He was introduced to the love of his life, Madeline Elaine Romino at a Saturday night dance in Fairmont. On May 29, 1943, at the age of 18, Dr. and Mrs. Greco were wed and began 70 years of marriage that continued until her passing in 2014. They had six children, 15 grandchildren and 13 great-grandchildren. Dr. Greco was widely known and respected for his passion for the art and practice of medicine. After a medical internship at Ohio Valley Hospital in Wheeling, he worked for the Weirton Steel Occupational Medicine Department before opening his family practice on Main Street in Weirton in 1949. A physician for nearly 70 years, Dr. Greco was convinced that medicine was an art not simply a science. He was known for his careful listening and connecting with his patients and believed that making a house call was a fundamental part of every family doctor’s practice. He often counseled young physicians that a doctor could learn more in the first five minutes of a house call than an entire thirty-minute office visit. In 1957, Dr. Greco accepted a Fellowship in Psychiatric and Family Medicine at Western Psychiatric Institute at the University of Pittsburgh and in 1961, Dr. Greco was awarded a Fellowship at the International Balint Society of England and Belgium. He was so inspired by his work with Dr. Balint that he authored the book, “One Man’s Practice”, published in 1965, that argued that a family doctor’s primary responsibility was to determine the patient’s “Actual Reason for Coming”, “ARC”, before deciding the course of treatment. Throughout his career, Dr. Greco devoted himself to identifying the health needs of his patients and the Weirton community. He particularly enjoyed delivering babies and delivered three generations of families. He was instrumental in motivating his medical colleagues to provide Weirton with the highest level of medical care. He founded the Brancazio Free Clinic for the Working Uninsured in honor of his close friend and colleague Dr. Dominic Brancazio. Dr. Greco also co-founded the Hancock- Brooke Mental Health Clinic and convinced the Weirton Rotary Club of Weirton to sponsor the radio show “Let’s Talk Health” on WEIR Radio and then moderated the program for over 15 years. For all his professional accomplishments, Dr. Greco’s most lasting legacy will be his love for his wife, his children, grandchildren and great-grandchildren. He enjoyed playing tennis and chess, walking to the river, discussing politics, reading and working in his yard, all of which he insisted on sharing with his family. He constantly challenged his family to critically think and ask questions, whether it was about a medical issue or a current event. “He wanted us to think about what we were doing and where we were going but at the same time he was also very supportive. He and Mom were always there for us, no matter what adventure we were taking” explained his daughter Donne Paine. Dr. Greco and his wife Madeline rarely missed attending a recital, game, graduation, birthday party or just a simple family dinner, no matter how far they needed to travel. “I remember calling home one day and my Mom explained that they were on their way to a patient’s granddaughter’s kindergarden graduation from St. Paul’s. I just remember thinking what a rich and incredible life my parents are living” recalled their son, Sam Hens-Greco. When their home on Riverview Drive was lost to a fire in 2010, Dr. and Mrs. Greco shifted the location of family events to Grandview Terrace, where they continued to pack family and friends into their modest apartment. On March 17, 2016, Dr. Greco made his final rounds at the Weirton Medical Center. The next day Dr. Greco suffered a stroke. He had seven patients scheduled in his office that morning. Even after his stroke and despite largely losing the ability to speak, Dr. Greco still managed to inquire about the health of his patients when they came to visit. Dr. Greco held many leadership roles in the professional and community organizations including serving as the President of the Medical-Dental staff of Weirton General Hospital from 1979-1987, President of the Medical Staff of the Fort Steuben Academy of Medicine and the Hancock County Medical Society. He was a member of Weirton Rotary for 61 years and served as President from 1967-68. He received Rotary’s Edward R. Hartman Award for Meritorious Service in 1975 and in 1995, and was honored with Rotary’s Man of the Year twice. He was a charter member of the Elks, a Third Degree member of the Knights of Columbus, and a member of the Holy Name Society of St. Paul Catholic Church. In 2013, Dr. Greco was inducted into the Weirton Hall of Fame and in 2016 the Weirton Medical Center Staff honored Dr. Greco by renaming the doctors lounge in his honor. In 1967, he participated in polio immunization program in Costa Rica through Brothers-Brothers Foundation with his daughters Donne and Diane. In 2009, Dr. Greco persuaded the Weirton Heritage Museum to sponsor the “Robert Haworth Memorial Art Show” to highlight the numerous Weirton area artists that were inspired by the Weir High School art teacher, Robert Haworth. As a supporter of Madonna High School, he was their Team Physician for many years. Throughout his life he and his wife Madeline traveled widely across the United State and abroad. In 1937, as a young boy he visited his parent’s Italian hometown, Bagnoli del Trigno and would return on numerous occasions. He was an avid fan of West Virginia University football. In 1960, he was at Forbes Field for Bill Mazeroski’s Game 7 winning home run, albeit, he had made the mistake of ill-timing his trip to the men’s room for the first batter in the ninth inning. Dr. Greco was preceded in death by his loving wife, Madeline Elaine Romino, and his two brothers, Tony Greco and Carl Greco. He is survived by his children, Donne Greco Paine, Diane Greco Fornari and her husband, Dr. Gabe Fornari, Deborah Greco Catton, Dr. Ray Silvio Greco II and wife, Kathy Greco, Sam Hens-Greco and wife, Judge Kathryn Hens-Greco, Dr. Rick Greco and wife, Dr. Carol Antonelli Greco. Grand children include: Dr. Gabriel Fornari , Jr., Dr. Luke Fornari (Alison), Melissa Paine Ketty (Sanjay), Seth Paine, Pia Catton, Grant Catton, Ray Silvio Greco, III, (Kristi) ,Meradith Greco Capps (Brad), Kaitlin Hens-Greco, Eliza Hens-Greco, Pasquale Greco, Dr. Christian Greco, Maria Grace Greco, Sophia Greco Venderlic (Logan), and Gabriella Greco Gahreeb (Paul). Great-grandchildren: Pierce and Ethan Fornari, Stella, Silvio, Diego and Enzo Fornari, Apolonia and Konstantine Ketty, Charlotte Paine, Crews and Madeline Capps, and Ray Silvio Greco IV ( Tucker). He was a devoted member of St. Paul’s Roman Catholic Church. Visitation will be at the Greco-Hertnick Funeral Home, 3219 Main Street, Weirton, WV on Thursday, October 19, from 6-8 p.m., Friday, Oct. 20, from 2-4 and 6-8 p.m. On Friday Oct 20 at 7 p.m. there will be a time for sharing of memories. Mass of Christian Burial celebrated Saturday, Oct. 21, 10 a.m., at St. Paul’s Catholic Church on Main Street, Weirton. Condolences to the family can be sent to the Greco- Hertnick Funeral Home, 3219 Main Street, Weirton, WV 26062. Our family would like to thank the staff of Serra Village for their many years of exceptional and loving care of our mother and father, Ray and Madeline Greco. Memorial contributions may be made to the Employee Scholarship Fund of Serra Foundation at the Weirton Geriatric Center, 2525 Pennsylvania Ave, Weirton, WV, 26062, or St. Paul Catholic Church.